Companies bought up a lot more wind and solar in 2018. Corporates are buying up a lot of renewable energy. Reports out this week from Bloomberg New Energy Finance and the American Wind Energy Association confirm that 2018 was a boom year for corporate renewables deals. Data from BNEF shows that clean energy contracts signed by corporations more than doubled between 2017 and 2018, to 13.4 gigawatts, signed by 121 corporations in 21 countries. The majority were in the U.S., which accounted for 60 percent (8.5 gigawatts) of the deals worldwide. The American Wind Energy Association's (AWEA) report (which only covers the U.S.) noted a 66 percent increase in wind-specific power-purchase agreements, with companies signing PPAs for 4,203 megawatts of wind energy last year. The numbers confirm forecasts that 2018 would be a record year for corporate procurement of clean energy. But BNEF’s numbers indicate just how meteoric the rise in corporate deals has been: Of the 32 gigawatts in deals signed since 2008, 86 percent came in the last three years and 40 percent occurred in the last year. 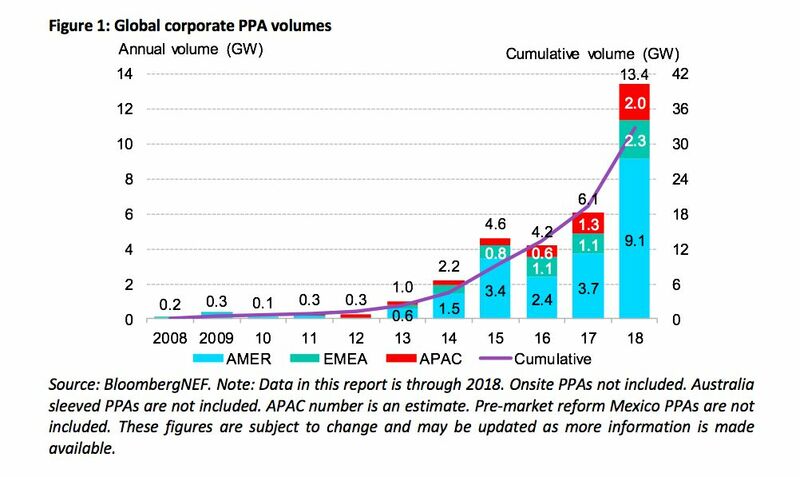 In the U.S., corporate PPAs saw a tripling over 2017. Facebook — which had a rough 2018 by other measures — far outpaced other companies with 2.6 gigawatts' worth of deals. For comparison, the Rocky Mountain Institute's Business Renewables Center pegs U.S. corporate renewable energy deals last year at 6.53 gigawatts, up from 2.78 gigawatts in 2017. Beyond the large, usually tech-focused market leaders, BNEF noted that the trend of small companies jumping into clean energy was an important feature of the market last year. The firm noted that 34 companies signed their first clean energy PPAs in 2018, which accounted for 31 percent of U.S. deals. AWEA’s report reiterated that theme, with new buyers accounting for 45 percent of non-utility wind deals signed last year. Deals where small companies can work with an anchor tenant that can offer the balance-sheet ballast to secure the deal are becoming more common. But other types of aggregation deals are also no longer an anomaly. Greentech Media recently reported on one of those aggregation deals, featuring Gap, Salesforce, Bloomberg and others. Each company took on 5 to 10 megawatts of solar, and the group said it hopes the format can provide a framework for other small offtakers. Oil majors are also jumping, albeit rather slowly, into clean energy. Both BNEF and AWEA pointed to contracts ExxonMobil (for solar and wind in Texas) and Royal Dutch Shell (which is working on offshore wind) signed last year. According to AWEA, the PPAs signed by non-utility entities in 2018 nearly equaled the capacity of utility PPAs from that year: The total tallies were 4,304 megawatts for utilities and a close second of 4,203 megawatts for non-utilities. Facebook came in third for wind-only deals, beat out by AT&T with 820 megawatts and Walmart with 533 megawatts. BNEF said the “healthiest signal” for growth moving forward is the push from corporate clean energy and sustainability goals. The RE100 initiative, according to BNEF, via which companies are committing to 100 percent renewables, could mean an additional 102 gigawatts by 2030 if companies use offsite solar and wind PPAs to meet their targets. AWEA noted that there are over 35,095 megawatts of wind under construction or in advanced development in the U.S., with non-utility buyers accounting for 11,300 megawatts of wind power to date.